The Sierra Madre Tattler! : Seriously, Does "Arcadia Andy" Bencosme Even Know Where Sierra Madre Is? Seriously, Does "Arcadia Andy" Bencosme Even Know Where Sierra Madre Is? Andy should ask Alpha where Sierra Madre is. We've had a lot of fun with the fact that Andy Bencosme held his campaign kickoff event at the controversial confines of the headquarters of the Arcadia Association of Realtors. Which, as most know, is located in Arcadia, and not the town where we think Andy believes he is running for a seat on the City Council. Or at least that is what we've been told. However, we are no longer certain. 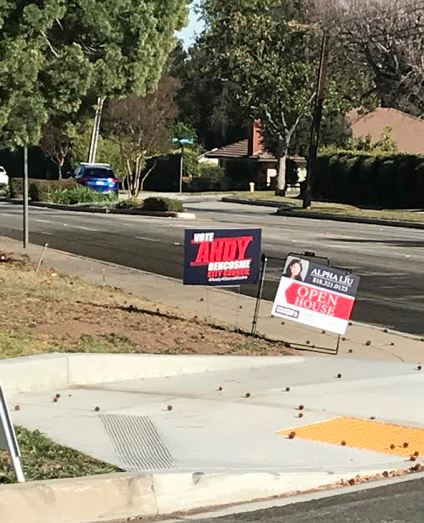 Apparently Andy's campaign is now making a concerted sign push in Arcadia. There might be more of them there than there are here. The photo here was sent to us yesterday by a resident of the Peacock Empire who wondered if this Sierra Madre candidate knew that he would not be able to pick up very many votes by campaigning in Arcadia. The sign pictured above can now be found at the corner of Foothill Boulevard and Arbolada Drive, which is a little bit afoot of the Foothill Village. Despite what some might say, we don't just criticize here, we also try to help. In case Andy reads The Sierra Madre Tattler, and we have no reason to believe he does, here is a map that helps to point out what part of Arcadia this particular sign is found in. 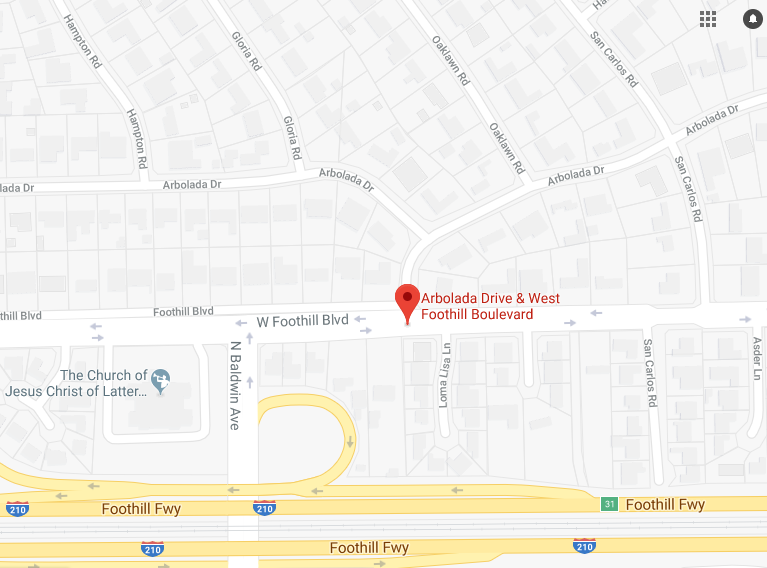 As people who are better acquainted with the area than Andy will tell you, the corner of Arbolada Drive and Foothill Boulevard is to the south of the City of Sierra Madre. To get here you would need to make a left on Foothill from N. Baldwin, and then take a right on Baldwin where it resumes its happy journey home. Upon getting there you would still have a ways to go before you safely arrive in Sierra Madre. I hope this helps. We're reaching out here. Maybe Andy was looking for cheap cigarettes? Yet another Andy Arcadia sign. The following story in the Pasadena Star News might offer us the clue we're looking for here. 2 men from Arcadia, Monterey Park accused of fraud scheme to avoid taxes on selling millions of cigarettes (Pasadena Star News link): Federal investigators arrested two San Gabriel Valley men this week in connection with an alleged scheme to procure and resell cigarettes without paying excise taxes through the Port of Los Angeles over the past two years, authorities announced Friday. Both defendants pleaded not guilty to a charge of conspiracy to defraud the United States during an appearance Thursday afternoon, Feb. 22, in federal court in Los Angeles, he said. They were ordered free on bond, and a trial date was set for April 10. We'll let you know if we find out anything more. Laugh all you want about politicians enlisting help from foreign jurisdictions, but it worked for Trump. Just because Andy is a joke doesn't mean he can't win. I think I have Andy bots on my Facebook page. We will see if the residents of Sierra Madre are dumb enough to vote for a candidate who wants to turn Sierra Madre into another Arcadia with about 100-150 homes torn down every year. He has the realtor and developer money behind him not just in Arcadia but also in Sierra Madre. Judy Webb Martin of Podley is supporting him. A real estate commission is evidently more important than preserving the town. Andy will have a lot of money behind him because realtors and developers have a lot to gain by his election. We will see if the good people in Sierra Madre will see through all the smoke. People need to keep the best City a Council Sierra Madre has had in a long time if not ever intact for at least another term. Please vote for Denise Delmar, Rachelle Arizmendi and Gene Goss. Andy will be a disaster for Sierra Madre as he promotes the agenda of the Arcadia Association of Realtors where he chose to have his campaign kick-off. Having your campaign kick-off at the Arcadia Association tells you everything you need to know about this candidate. It also tells you that he's not as smart as he makes himself out to be. Most people try to hide their relationship with the real estate interests. I guess he does deserve kudos for honesty. Then if he gets elected the people will deserve what they get. 7:59 AM - Judy Webb Martin is supporting him? Oh no, not a good. She has been very successful at convining people in town that she looks out for Sierra Madre and she could tip in his favor. Who is the most vulnerable of the three? Any thoughts? Who's laughing? Andy is intentionally or not? Displaying an interesting advertising angle propping up his signs near major driving cooradors as reminders of who is running for Sierra Madre City Council. 5:57 am. You are spot on with the assessment of foreign nationals helping with Canadiates campaign, here's hoping it works again. You spell this way on purpose, right? I think if you put your signs in another town, or kickoff your campaign with an event in another town, you come off as being a little clueless and out of touch. Maybe these signs are on Foothill to attract the Monrovia vote. I think when Bulldozer Harbicht puts signs in other districts, or kicks-off his campaign with spreading lies about the proposed preservation ordinance, he comes across as being a little clueless and out of touch. He does appear to have gone a bit dotty. 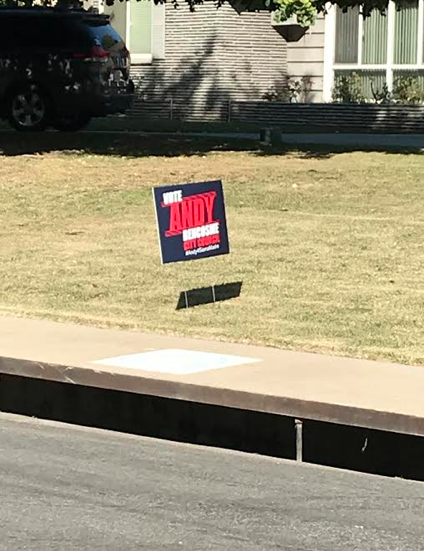 My guess is Andy has enlisted realtors for sign duty, and they're just putting them anywhere. They don't have a clue about what they're doing, which is not surprising. They are not really into local politics. But this does show some very low level management by the candidate. You have to guess that anyone who votes for Andy is in the business or is clueless to preserving Sierra Madre. Mod, have you or someone else actually reported Andy's illegal signs to the FPPC? Least we could do is make him follow the law for the signs he clutters Arcadia with. They are not illegal. The law changed. What's another criminal act between friends? In terms of campaign signs, during a recent election Mitch Englander decided to clutter Arcadia with campaign signs, some atop 20 ft light poles at Duarte Rd and Santa Anita. City of Arcadia would do ZERO to remove them. I spoke with city mgt and they admitted they wouldn’t do anything to have them removed in fear of lawsuits. So all you candidates out there, put your trash signs wherever you want !! Any voter persuaded alone by campaign signs is a true fool. You can make fun of Andy but that is the wrong thing to do. He knows what he is doing. He is making himself visible to the real estate brokers, developers, and business owners who will profit greatly if he is elected. With their support he will win. Instead of making fun of his strategy you should do something to help re-elect the 3 incumbents. No. Laughing at Andy is OK. He is a self-important puppet of the development industry and laughter is a wonderful antiseptic to that kind of stuffed shirt. And when he wins while we are laughing it will be too late. Want the last laugh, put a Delmar, Arizmendi, and Goss sign on your lawn. Them you can be proud that you did something to protect Sierra Madre from the outside forces who want to destroy our town. I will have all 3 sings on my front yard. I think it’s nice that the Tattler is trying to help Andy find his way. I for one am grateful to the Tattler for exposing the jerk who's sneaking into our council race. No one else has done it. There is a lot of fear out there. Nobody says much of anything. 8:38, you have an awful lot of faith in lawn signs. Most low information voters in Sierra Madre feel threatened by real issues. Their idea of a good candidate is someone who will pat them on the head and tell them how nice they are. And, of course, those who run for office, or run their campaigns, are scared to death of these idiots. Here in Sierra Madre we are always a target for the worst kind of developers. Because Sierra Madre was preserved the development that would be uncorked here would be far more profitable. Sierra Madre would be a gold mine for them. That is why the so much foreign money is being invested in this campaign. Bencosme is a puppet candidate. 8:54 - "I think it’s nice that the Tattler is trying to help Andy find his way." Should we try a trail of bread crumbs? With all that’s happening in the Arcadia election, the PSN covers illegal cigarette sales. This is why I don’t subscribe to PSN. The Star News offices are located in a building owned by the guy bankrolling the campaigns of Harbicht, Chandler and Bencosme. The Star News will endorse all three. Will David Lu be home in time to vote for Harbicht? Maybe he'll vote absentee as part of a prison outreach program. Judy Webb Martin of Podley would cheat her own mother out of her last dollar. Realitors Andy Bencosme and Martin have their hands in your pockets and flash their fake smiles, hoping to gain your trust. There’s likely a ‘special’ state prison ward for ex local CC members, populated by ex Bell and Temple City CC members. Wuo destined for membership, with a cot reserved for Shogun Tay. Just a matter of time until adequate evidence is found to substantiate Tay’s new mailing address. Question: does the prison store sell hair dye to inmates? Just remember all you developers out there, Tipping, Mur Sol, Million Dollar Construction, we are going to keep fighting your greed and will be thorn in your side forever. In local races, it's hard to trace the money. They donate individually to hide the company affiliation. The same mainland Chinese money that brought the McMansion boom to Arcadia is now behind the Bencosme campaign. Do you really think they care about all of the usually phony issues that dominate campaigns like this? This is one big ugly power play. Wake up and smell the bulldozers. I gotta know how my Chinese neighbor came up with $800k cash to buy their house. Is it really laundered money ? Furthermore, tieing up $800k in one house isn’t Phi Betta Kapaa, could get better return elsewhere. How do you get a Delmar lawn sign, or Arizmendi's or Goss'? Go to Delmar's kick off today. Will it be in Sierra Madre? The kick off is anytime from 2-6 at 441 Ramona, the Gold's beautiful home. You bet it will be in Sierra Madre! Today 2:00PM. His real name is Jose Andres not "Andy"
For a long time, Sierra Madre was not all that desirable. The money was in Pasadena, or Arcadia, or La Canada. Sierra Madre was not chic. Then Bart Doyle, Building Industry attorney, suckered enough people to win a council seat, and the word went out in the development community: the nicer places are built out, so come and take a look. By that time, we were "quaint" and the push to over-develop started in earnest. The Heflin estate and the One Carter disaster for the hillsides happened, and the 4 story downtown specific plans were drawn up. We lost those areas in the hillsides but drew the line at losing the downtown. Realtor Bencosme is just another attempt to have development dominate this small town. It appears the library folks like him a lot. Maybe they figure if he gets elected they’ll get what they want for the library. It is all about the Library property, of course. "Library Villa Estates, brought to you by Century 21." Andy is presenting the people of Sierra Madre with yet another great opportunity to vote against their own interests. Trump settles yet another breach of contract lawsuit by agreeing to pay $5.45 million. Certainly not a small nuisance settlement considering his company will be paying $.94 for every dollar sought. Can't Trump conduct any business honestly? New CNN poll has Trump with a 35% approval rating. Lowest yet. Bulldozer Bob will go down in flames (again) just like Andy. People are smart and see thru the BS. Bart Doyle paid out good money to obtain a seat on the Sierra Madre Council. 3) Millions in interest only water bond debt.